The electromagnetic spectrum represents the range of varying wavelengths and corresponding frequencies associated with different types of electromagnetic energy. The left of the spectrum, such as radio waves, contains electromagnetic energy that si of longer wavelength and shorter the frequency (LF) or extremely low frequency (ELF) which also corresponds to lower levels of energy. This is why radio and television waves or cellular signals are not considered to be dangerous forms of radiation like their counterparts on the right side of the spectrum. Towards the right side of the spectrum are more dangerous forms of radiation including microwaves, ultraviolet radiation, and finally alpha/beta rays which are higher in energy due to their relatively higher frequencies and shorter wavelengths. When waves travel at these high frequencies, they can bombard other objects with more energy, which can potentially do damage. This is why x-rays and ultra-violets rays, for example, are considered to be dangerous to human skin, cells, and tissue and why protection (such as sun screen or a lead vest) should be used when in contact with them. 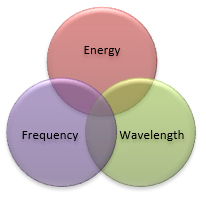 As wavelength increases, frequency decreases, and energy decreases. 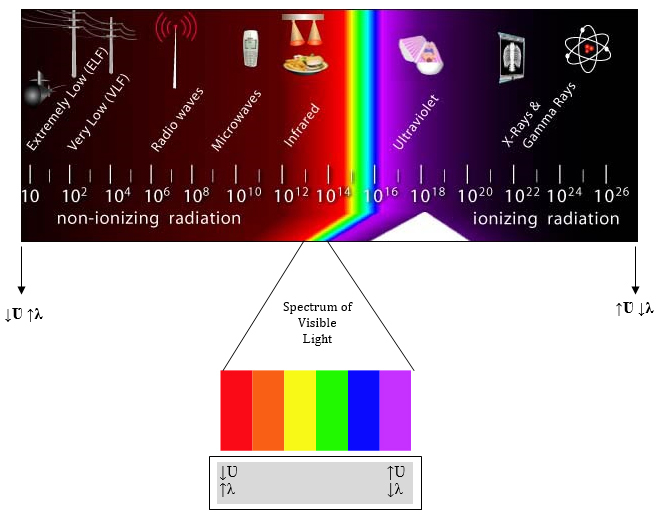 The middle of the electromagnetic spectrum houses the spectrum of visible light, which contains the colors of the rainbow, beginning with red light at 800nm and ending with violet at 400nm. Infrared waves are found just before “red” light and ultraviolet light is found after the violet end of the spectrum, hence the similarity in the names. These are forms of electromagnetic energy that are visible to us: think of light cascading off of a water, prism, or chandelier and reflecting a rainbow of colors on the wall. The colors of the visible light spectrum can also be utilized to identify properties of elements based on their line emission spectra.